Fully Rigged and Fully Equipped 27' Sloop - "Do Not Disturb" Skipper is not able to continue sailing, so the boat must be sold. Sailed in fresh water most of it's life and stored in a pole barn. 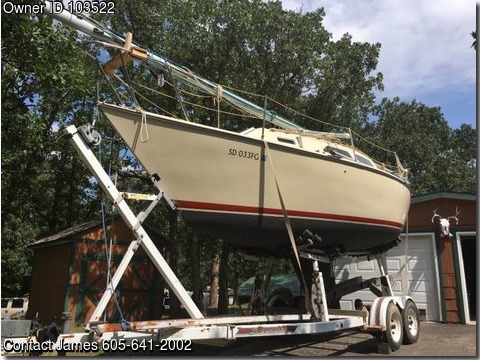 this US 27 is an outstanding sailboat. It is an extremely comfortable cruiser with great performance capabilities, a very responsive sailboat that can be sailed single-handed. It has a unique U shaped cabin for on-board entertainment, stand up headroom, full head and shower and it can sleep 4+ comfortably. Standing rigging includes main, jibs, spinnaker and extra halyards for multiple head sails. This Blue Water rated boat is trailer able with a custom heavy duty EZ Loader and a 35' telescoping extension for launching on boat ramps. A 10hp Honda auxiliary outboard is included. For a full list of specifications and equipment included, contact seller. Asking $12,000 (OBO) including lots of accessories and instructions for set-up. Delivery to your location is negotiable.